A big part of the 2.1.0 re-write was to update the user interface. As any script grows, the question is no longer can this script do such-and-such, it's: how easy is it for this script to do such-and-such. 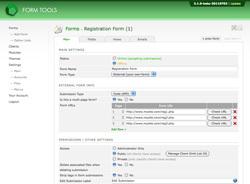 Form Tools has an astonishing amount of functionality available, but equal emphasis has to be placed on how easy it is to configure. With this in mind, all sortable lists that appear within the interface are now sorted by drag-and-drop. 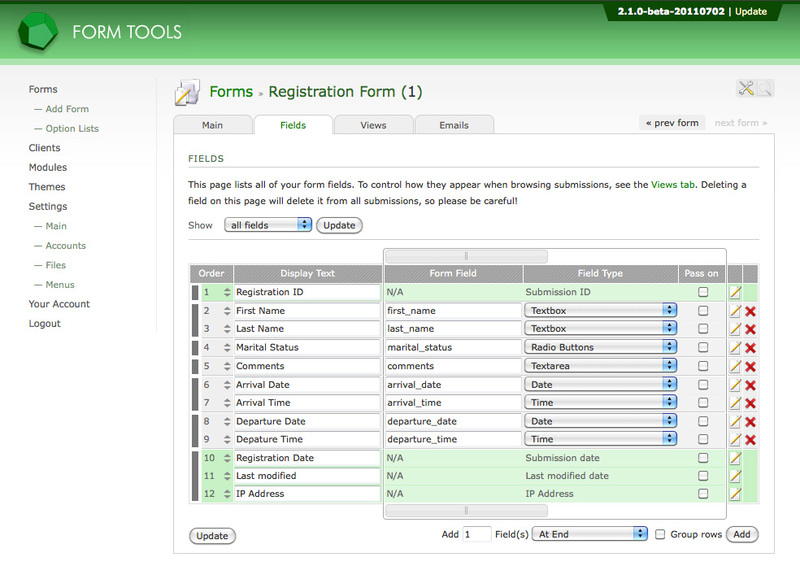 In the earlier 2.0.x releases, you'd need to manually enter a number for each row then update the form. This was far too slow. Secondly, some sortable lists - such as the Edit Form -> Fields tab, and Edit Menu pages - now allow you to group multiple rows so you can sort them by dragging multiple rows in one go. Once you get familiar with how it works it becomes second nature. 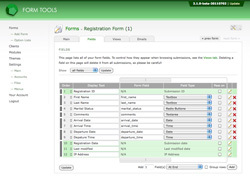 "Sortables" are pretty common, but I invented the "Groupables" for Form Tools. Even though it's non-standard, I hope that once you see how it works once, you'll get the idea and use it anywhere it appears without any additional learning curve. Lastly, there's a third user interface pattern: grouped sortables. These are multiple lists of sortable elements that themselves can be sorted: i.e. one list can be sorted by dragging it above or beneath another list. For example, on the Edit View -> Fields tab. Okay, I'll stop speaking gibberish. Let's look at each for something more concrete. Sortable lists are easily identifiable by their first "Order" column. Sortable rows have an up-down arrow at the right of the Order column, indicating that the rows can be sorted. In addition, when you mouseover the Order column, the cell is highlighted. To sort them just click on the Order column and drag it up or down. 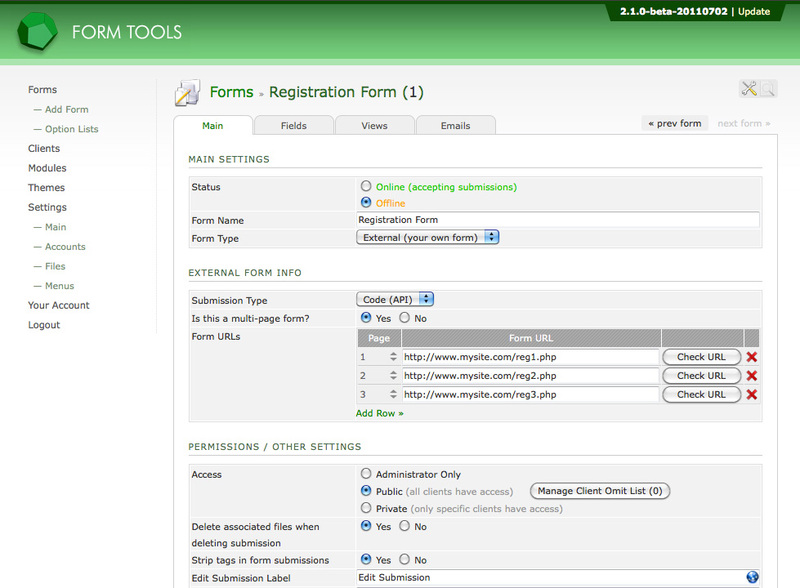 In the screenshot to the right, the URLs of the forms in the multi-page form are in a sortable list. You can drag them up or down to the re-sort them. As with any sortable list, you'll need to click the form's Update button to actually save the new order. Take a look at the screenshot to the right. Notice anything funny about the first "Order" column? Down the lefthand side there are blocks of solid grey - some with different heights than others. That column indicates that the rows are also groupable. Sometimes, you may find that it's convenient to move around multiple rows a block. Some data belongs in groups. For example, if you had a registration form, you might want to group together Contact Information, travel information, hotel information, emergency contact information and so on. 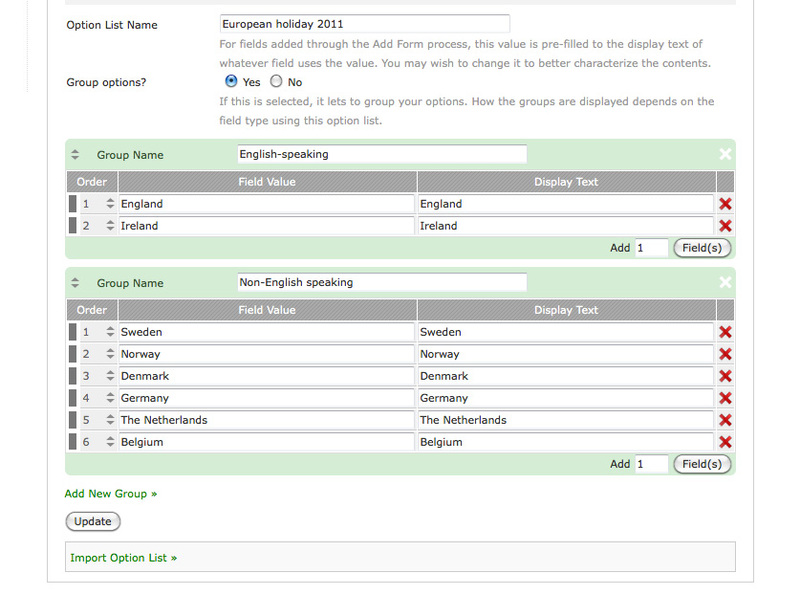 And if you're creating multiple Views, it can be convenient to drag and drop those rows as groups. That's the point of the Groupables. To group two rows, they must first be next to each other. Then, click click the space between the columns at the far left of the row. As you mouseover it, it will change to indicate it can be clicked. When you click it, move the mouse over the Order column and notice that now when you click and drag it, it moves both rows. Similarly, to separate two rows, just click between the rows again. Urgh. Seriously? So we have Sortables, Groupables and now Grouped Sortables? Yeah, I know. If anyone more creative than myself has a better term for this, please let me know by posting a suggestion on github. Grouped Sortables are groups of sortable lists in which each list can itself be moved up or down. Take a look at the screenshot to the right. That's a shot of a simple Option List, with the options arranged in two groups: English-speaking and non-English-speaking. The contents of each list can be dragged and dropped within the same list, as you would expect, but also, you can drag items from one group to the other. So if I added another English-speaking country to the non-English Speaking country group by accident, I could drag it to the other group. Secondly, notice the up-down arrow in the green area at the top left of each group? That means that the groups themselves are sortable. Just click there and drag the entire group up or down to place it before or after other groups.